The Buono Kettle, with its long curved spout, is designed for a controlled pour - to get the optimal extraction out of a pourover brew. 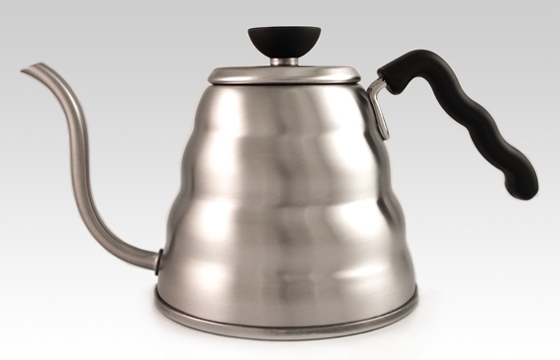 Once you try using these for a pourover brew, you'll wonder how you ever lived without it! * Easy to operate. One flip of the switch to boil water. * Automatic Power Off - Automatically switches the Kettle off when water is boiled. * Boil-dry Protection feature - Automatically cuts off power in the event of accidentally turning on an empty kettle. * Cord-less kettle can be attached/detached 360 degrees all around. Easy to carry and pour. * Power cord may be stored under the bottom of power plate. Please note - our Hario flow restrictor does not fit in the Hario Electric kettle.